We are thrilled to be offering support to this year's Birthday Benefit! Shannon Thompson created the Birthday Benefit party six years ago to celebrate her birthday in a fun and meaningful way, bringing together great people and great music to raise a pile of money to donate to a good cause. Each year there is a new beneficiary. This year, Shannon has chosen Life Flight, Maine's nonprofit critical care transporter, a service that has personally touched our lives and the lives of many in our area. 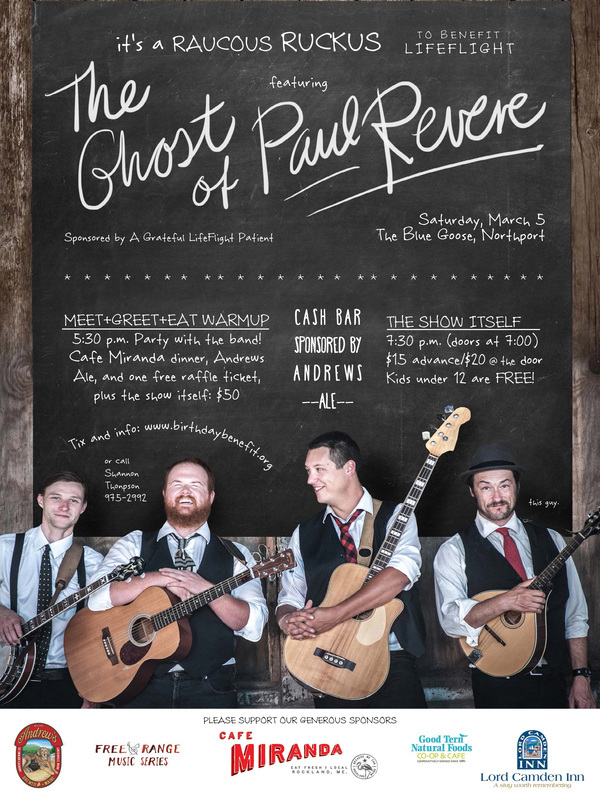 Free Range alum, Ghost of Paul Revere will be leading the old-school dance hall. Stomp and holler the winter away while raising money for Life Flight! We hope you'll join us on March 5th for a rowdy, raucous good time to celebrate meaningful work, life, and the birthday of an amazing woman doing good things in our community.